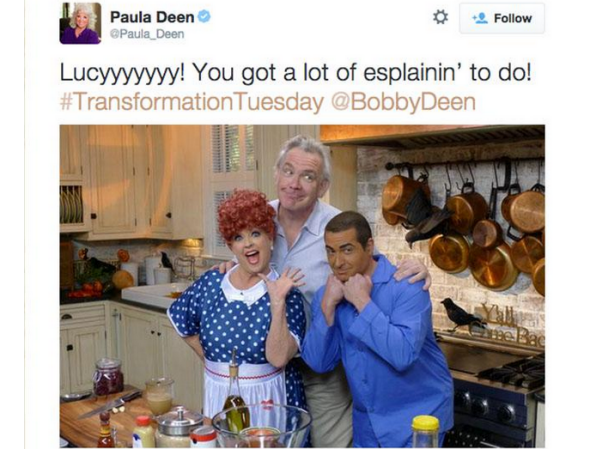 Paula Deen’s racist brownface stunt isn’t even accurate. Noted user of the N-word, Paula Deen, received withering criticism for insensitivity again on Tuesday after a photo of her and her son dressed as Lucy and Ricky Ricardo, in which her son is wearing brownface, was posted from her official Twitter account. The problem with Deen’s latest racist antics—aside from the obvious fact that blackface and brownface are never okay—is that Ricky Ricardo was white. He was Hispanic. But he was white. So, this particular instance of brownface was not only morally wrong (and lazy; they didn’t even bother to paint his hands brown), it was also inaccurate. Ricky and Lucy were considered one of the first interracial couples on television, even though Desi Arnaz, who played Ricky on I Love Lucy, came from a white Cuban family. Despite being white, television executives opposed his casting, saying the public wouldn’t go for a “Latin” as the husband of an “All-American girl.” It was only after Lucille Ball insisted that they reluctantly agreed.